Just in time for the quintessential American holiday Pew Research Center released the results of a survey to find out what people find most meaningful in their lives. 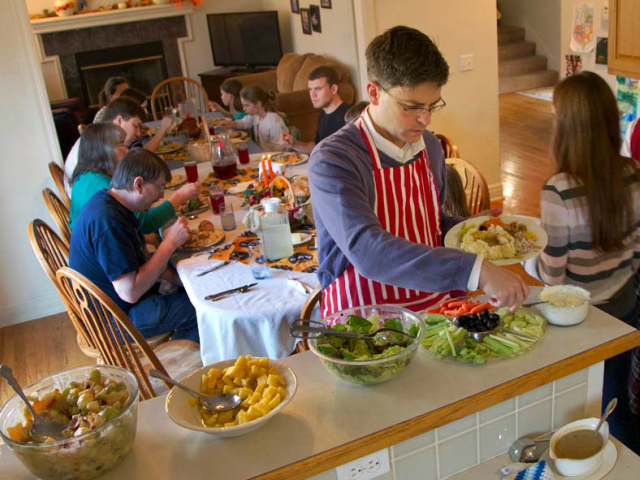 And as we gather around Thanksgiving tables across the country, it turns about family tops the list for most of us. Pew conducted two surveys in late 2017; one asking open-ended questions to allow respondents to say in their own words what made life most meaningful and another that let them pick from a list of choices. “Across both surveys, the most popular answer is clear and consistent: Americans are most likely to mention family when asked what makes life meaningful in the open-ended question, and they are most likely to report that they find “a great deal” of meaning in spending time with family in the closed-ended question,” Pew reported. But aside from family, Americans had a wide range of what is important in their lives — one third cited career, nearly a quarter said stable finances and one in five named their religious faith, friendships, hobbies and activities as important to their happiness. There were, however, more nuanced answers that reveal what makes Americans find meaning in their lives. In the closed-ended question, the most commonly cited sources that provide Americans with “a great deal” of meaning and fulfillment (after family) include being outdoors, spending time with friends, caring for pets and listening to music. By this measure, religious faith ranks lower, on par with reading and careers. But among those who do find a great deal of meaning in their religious faith, more than half say it is the single most important source of meaning in their lives. Overall, 20 percent of Americans say religion is the most meaningful aspect of their lives, second only to the share who say this about family (40 percent). • Americans with high levels of household income and educational attainment are more likely to mention friendship, good health, stability, and travel. A quarter of Americans who earn at least $75,000 a year mention their friends when asked to describe, in their own words, what makes life meaningful, compared with 14 percent of Americans who earn less than $30,000 each year. Similarly, 23 percent of higher-income U.S. adults mention being in good health, compared with 10 percent of lower-income Americans. And among those with a college degree, 11 percent mention travel and a sense of security as things that make their lives fulfilling, compared with 3 percent and 2 percent, respectively, who name these sources of meaning among those with a high school degree or less. • Politically conservative Americans are more likely than liberals to find meaning in religion, while liberals find more meaning in creativity and causes than do conservatives. Spirituality and faith are commonly mentioned by very conservative Americans as imbuing their lives with meaning and fulfillment; 38 percent cite it in response to the open-ended question, compared with just 8 percent of very liberal Americans – a difference that holds even when controlling for religious affiliation. By contrast, the closed-ended question finds that very liberal Americans are especially likely to derive “a great deal” of meaning from arts or crafts (34 percent) and social and political causes (30 percent), compared with rates of 20 percent and 12 percent among very conservative Americans. • Regardless of their particular religious denomination, black Americans are more likely than others to mention faith and spirituality when describing (in the open-ended question) what gives them a sense of meaning.3 Fully three-in-ten black Americans (30 percent) mention spirituality and faith, compared with 20 percent of whites and 15 percent of Hispanics. • Younger Americans less likely to mention religion, but draw more meaning from learning than older Americans. Just 10 percent of U.S. adults under age 30 mention spirituality, faith or God when describing (in the open-ended question) what affects their sense of meaning. By contrast, three-in-ten adults ages 65 and older mention religion when describing what makes their life meaningful and fulfilling. You can find the methodology for the Pew survey here.